Comic Book Resources got an exclusive look at Tom Taylor’s comic The Deep with a 10 page preview and a very nice interview. You might know Tom from his work with Star Wars as the comic writer for the Invasion series, Blood Ties, Luke Skywalker and the Treasure of the Dragonsnakes, or The Will of Darth Vader. In the interview Tom reveals that he created The Deep with the intention of providing a comic book that his son could enjoy, as well as himself. This motivation also spurred him to work on the Star Wars Adventures graphic novellas. The Deep focuses on a family of explorers who venture into the mysterious depths of the ocean, that last unexplored frontier. The preview presents some wonderful, richly colored artwork and that has a Pixar The Incredibles feel to it. The story itself has an interesting hook with a promise of sea dragons. If you’d like to find out more about The Deep, or if you’d like to buy a copy, then check out ExploringTheDeep.com. Star Wars Books posted on their Facebook page today that artists Jeff Carlisle and Chris Trevas will be illustrating the upcoming Star Wars: Essential Reader’s Companion. The Star Wars: Essential Reader’s Companion is slated for release in August 2012. Written by Pablo Hidalgo, the book will serve as a guide for novels, short stories, eBooks, etc all organized chronologically with in-universe and out-of-universe dates, and will include brand new illustrations. The guide will be similar to the Star Wars: The Comics Companion. 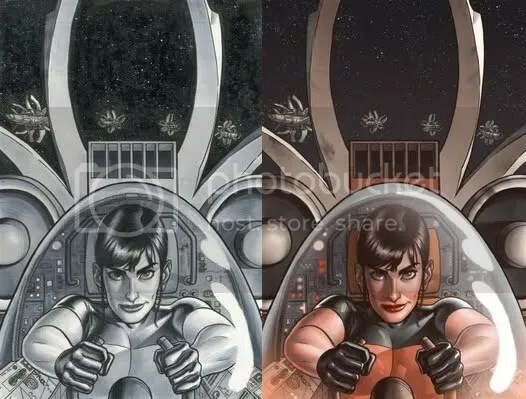 You can check out Jeff Carlisle’s official site here as well as the Star Wars illustrations he has done in the past. 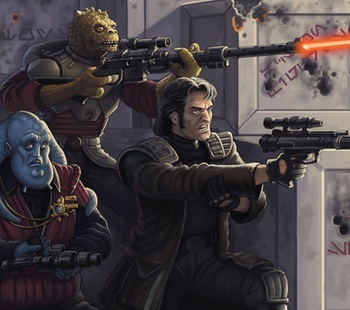 You can check out Chris Trevas’ official site here as well as his Star Wars art work. Posted By: Skuldren for Roqoo Depot. Our Jawas work hard so you don’t have to. Today’s funny comes to you courtesy of One Minute Galactica. Enjoy this revised version or as we like to think, what really happened on the Death Star. Poted by Synlah for Roqoo Depot. We aim to amuse. Knight Errant cover artist Joe Quinones shared the pre-digital cover of Deluge #2 on his blog, along with some comments on what he used for the cover. For this issue, he used Copic brand sketch markers (for the first time) and Dr. Ph Martin’s Bombay Black India Ink for the inking process.